Vitiligo is a condition that occurs in the skin which causes white pale patches. The condition can affect any gender, age & ethnicity. The condition is long term and occurs when there is a lack of Melanin in the skin. Melanin is produced by special cells called Melanocytes which give the skin its colour and protects it from the sun. The condition differs from person to person. Some people get large patches which eventually join up, whereas others only get a few small patches. The most commonly effected areas are those that are exposed to the sun; such as the hands, face & neck. The cause of the lack of Melanin is not known for certain but Vitiligo has been linked to problems with the nerve endings and the immune system. One thing that is known is that Vitiligo is not contagious and it is not caused by infection. We understand that Vitiligo can cause problems with self-esteem and confidence and that those with Vitiligo may want to conceal the affected areas. 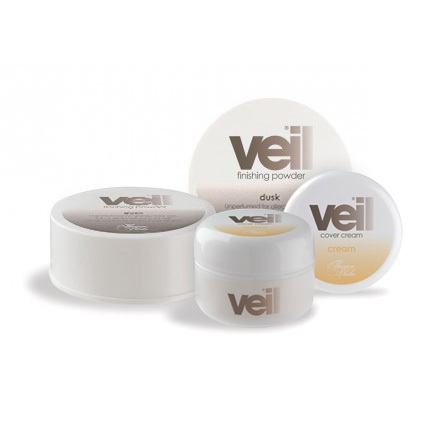 Veil Cream can be used as a Vitiligo makeup product to help conceal/camouflage these white patches and blend them in to match the rest of your natural skin tone. Or blend in the small coloured areas with the pale areas. The first step to carrying out a Vitiligo cover up is to find the correct shade to use. To do this we have Sample Kits available for you, to help you find your perfect shade; Light, Medium & Dark. Click here to get your Sample Kit. When looking for the correct shade, you want to find a colour that matches your natural skin tone around the white patches. To do this, take your time and try the selection of shades in natural daylight to ensure that your match is accurate. There are 40 colours to choose from and you are also able to mix the creams to create your own shade should you prefer. Once you have selected your chosen colour, you can then purchase one of our full size cover cream jars & finishing powders. We recommend applying the cream in thin light layers (as opposed to one big layer) using a dabbing or stippling motion rather than using a rubbing motion as Veil contains a lot of pigment, meaning that you need very little product to get good full coverage. By applying gradually you also get a more natural finish and avoid the area appearing cakey and heavy. When applying the cream to white patches, make sure to blend out harsh edges and lines where your skin tone and the white patches meet. This gives a much more natural look. Once you are happy with your coverage, we recommend you set the makeup with our finishing powder. By doing this you set your cream in place, eliminate shine and give the make up a waterproof finish and ensure that you have the maximum lasting power for your cover up.